The most unforgettable things to see and do on the island. 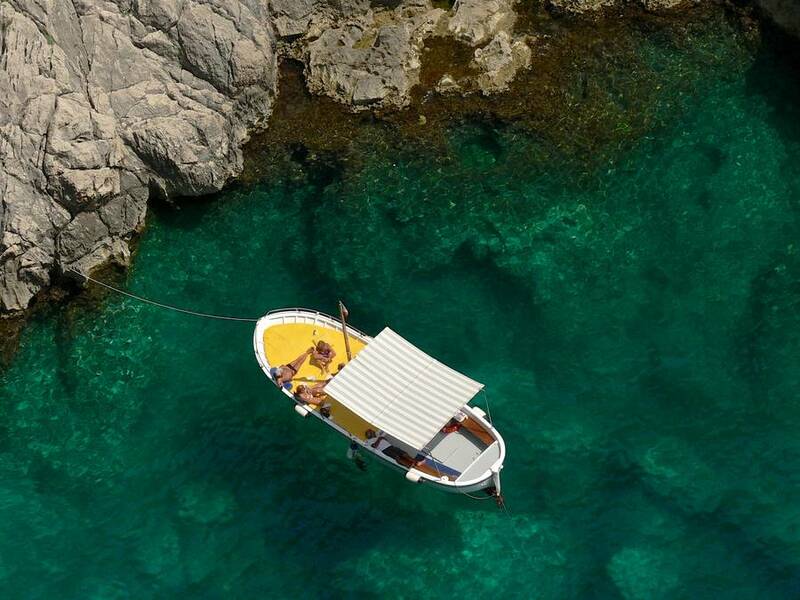 Discover Capri from the sea, then lie back in a wooden rowboat to enter the magical Blue Grotto. 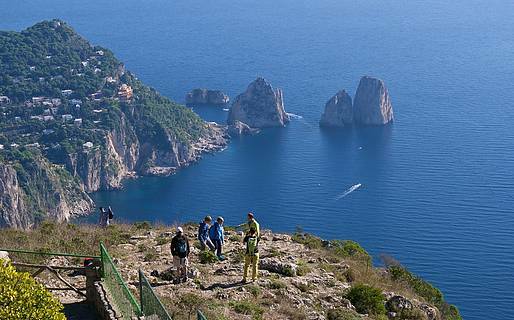 Boat tours depart from Capri's port, Marina Grande, then continue on past Tiberius' Leap along the southern shore of the island to the famous Faraglioni rock formations, round Punta Carena with its picturesque lighthouse, and make a stop in front of the Blue Grotto. Here, those wishing to visit the grotto can climb aboard small wooden rowboats, the only vessels able to fit inside the sea cave. You can either choose to join an organized group tour, or hire a boat with skipper just for youself! 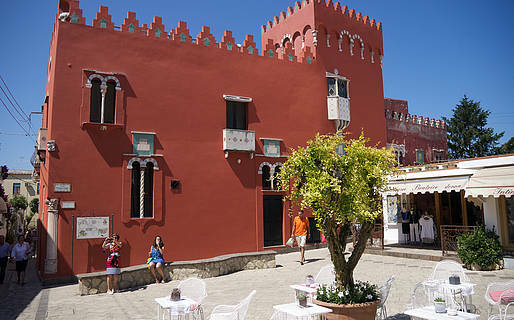 Anyone visiting the island should stop in the famed main square, known as the Piazzetta, and while away a few minutes at one of the outdoor café tables to indulge in a bit of people watching. 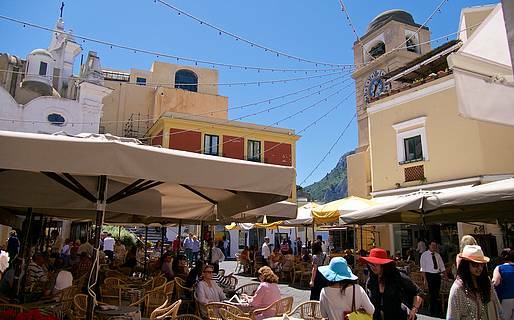 Either for a morning espresso or for an aperitivo cocktail in the evening, a visit to the Piazzetta is a must. 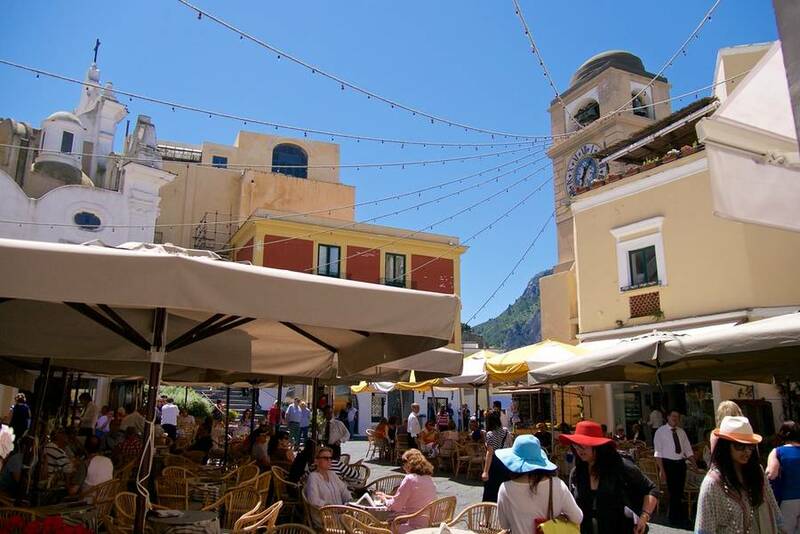 If you'd like to rub elbows with VIP visitors, the best time of day is between 7 and 9 pm, when the lion's share of daytrippers has left and famous actors and celebrities come onto the island from their yachts to enjoy an evening on Capri. Which, of course, begins with a cocktail in the Piazzetta. How much does an espresso in the Piazzetta cost? If you order from an outdoor table, an espresso will cost around €4. Cocktails costa around €10. The prices at the square's cafés are roughly the same. 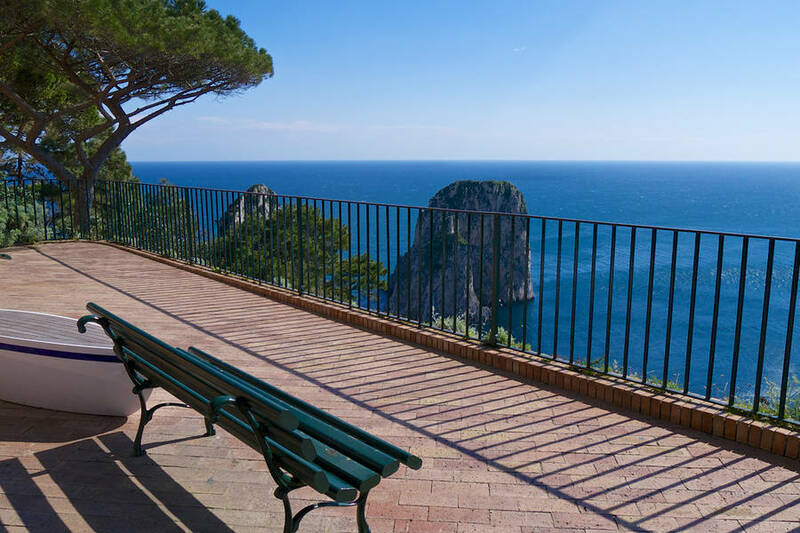 From Piazza Vittoria in Anacapri, you can can take the chairlift up to the peak of Mount Solaro where you can take in the view from the top, snap pictures, and stop for a drink at the "La Canzone del Cielo" café. Walk back down the mountain slope, following the signs for the Cetrella hermitage, a tiny chapel perched on the mountainside which was once a retreat for hermits. If the church is open, take a peek inside; the custodians will be happy to show you the gorgeous terraces over the sea. From the Piazzetta, walk down towards the Hotel Quisisana, making sure to window shop at the luxury boutiques along the way. Once you turn the corner, you'll find yourself on the bright, silent Via Tragara. 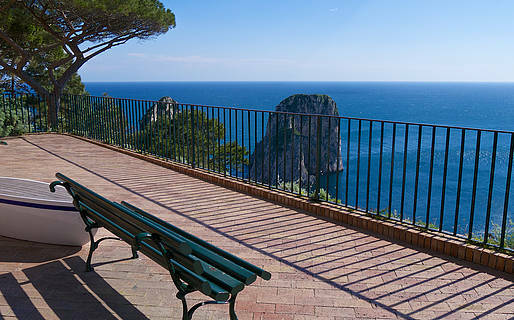 This lane skirts the gardens of the most beautiful villas and hotels on Capri, with the sea shimmering beyond the sweet jasmine and colorful bougainvillea, ending at a scenic overlook facing the Faraglioni rock formations. 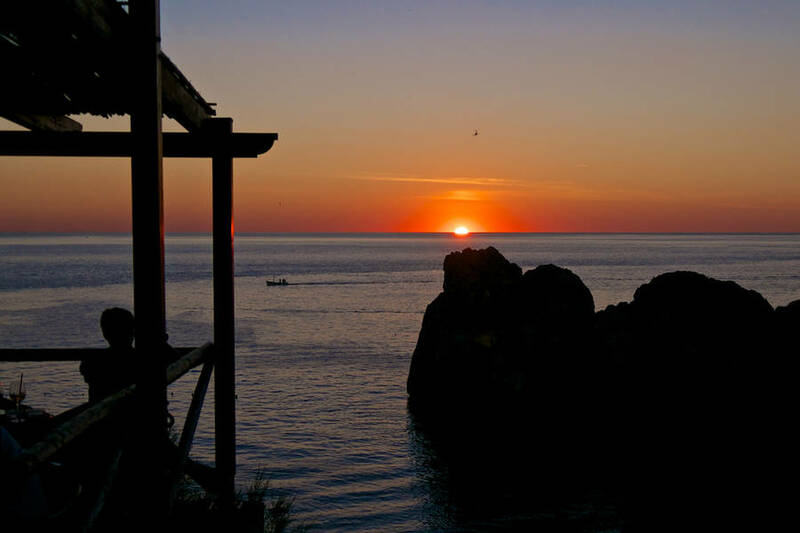 Where can you see the most spectacular sunset on the island of Capri? 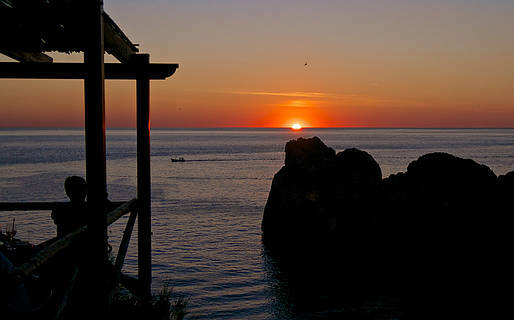 Definitely from the Punta Carena lighthouse, the only spot on the island where you can watch the sun sink into the Mediterranean. Try to arrive at the lighthouse in the afternoon, take a dip in the sea, sunbathe for a bit, then sip a cocktail while you watch the sun set. 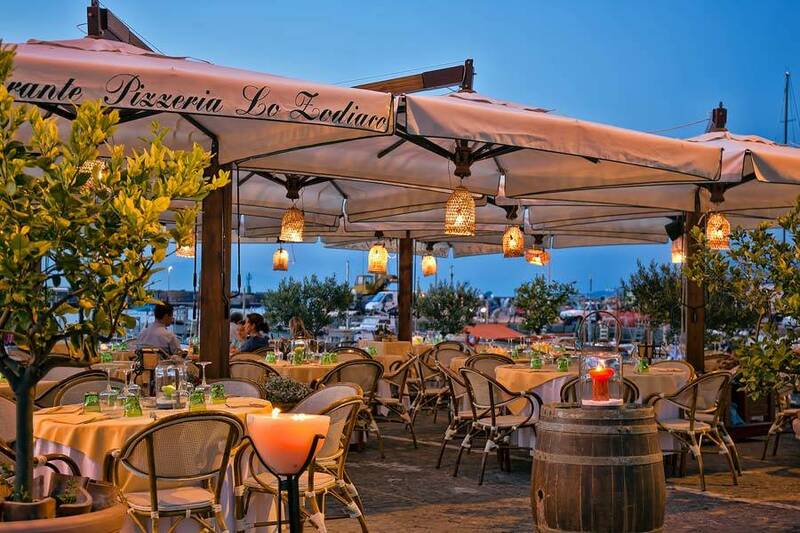 The best way to end your day on the island of Capri is with a romantic dinner with a view or a traditional dinner featuring island specialties. 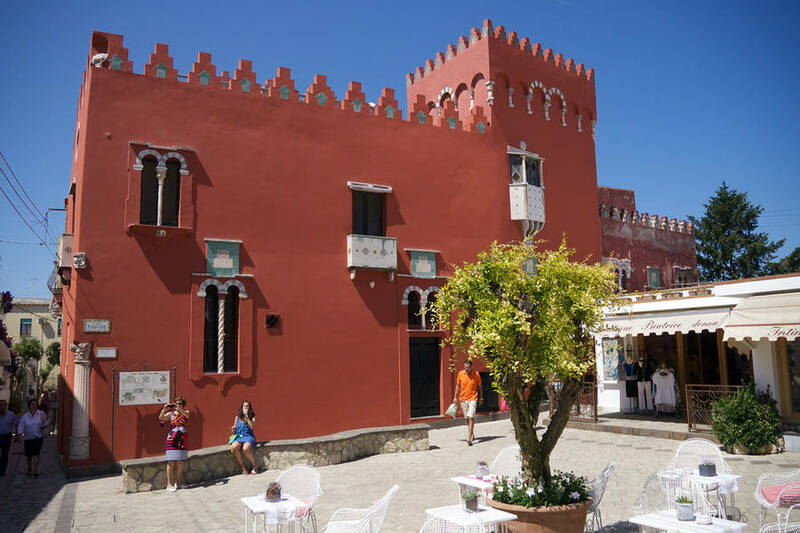 If this is your first time on Capri, don't forget to sample the traditional local dishes ravioli capresi, filled with caciotta cheese and marjoram, and torta caprese, made with chocolate and almonds. 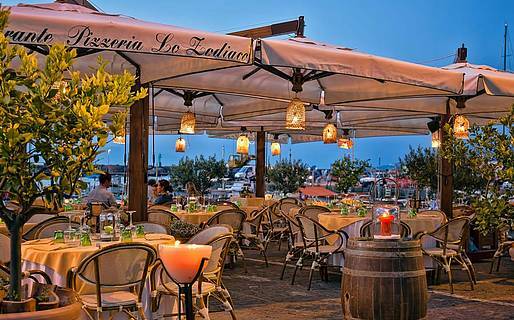 Here are a few suggestions about where to go to dinner on Capri. "What should we do tonight?" This is the standard question posed during cocktail hour in the Piazzetta, while everyone is still seated around the outdoor tables drinking in the last of the day before nightfall...a languid afternoon ritual that forces visitors to the island to slow themselves down to match the unhurried pace on Capri. After a cocktail or two, the crowds gradually move on to dinner. 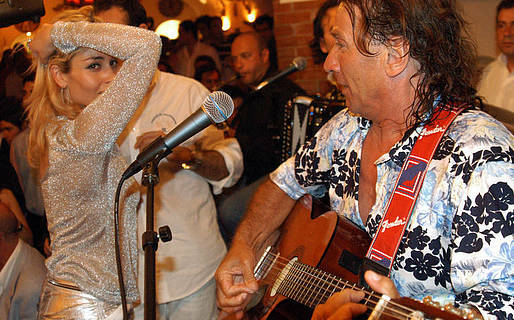 Only at around midnight do the island's nightclubs begin to fill...among these local hotspots on Capri are the so-called "taverne", including Anema e Core, with live bands leading the crowds in song and dance to the rhythm of tarantella or Neapolitan classics. 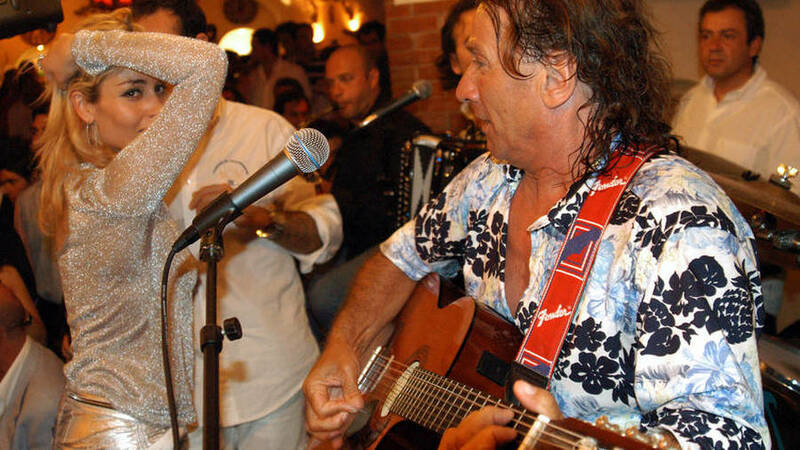 Capri is an informal island, and visitors can dress as they please. In a few of the more formal restaurants (those, for example, in luxury hotels), long pants are required for men. 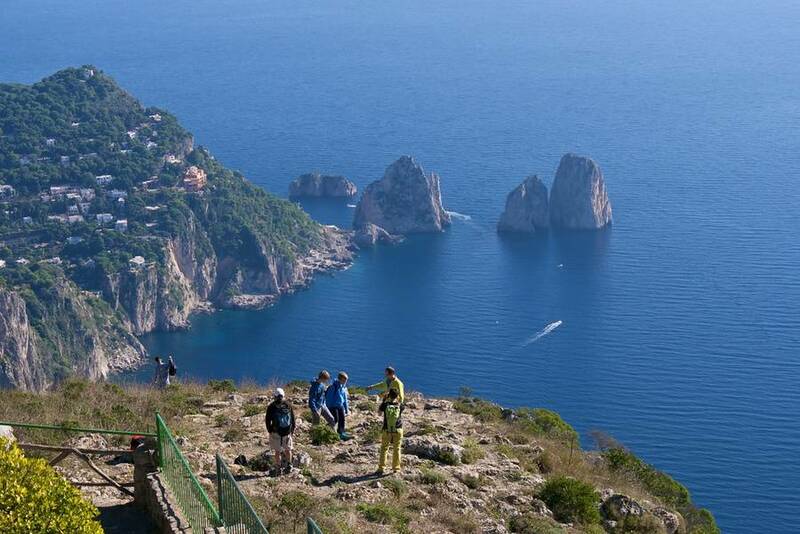 Women are advised to leave their high heels at home, as the steep lanes on Capri are difficult to navigate in heels. You are much better off following in the footsteps of Brigitte Bardot and Jackie Kennedy, who made flat "Capri sandals" famous. What's better than relaxing on a sun lounger, drink in hand, and gazing out over the crystalline waters of the Mediterranean? Capri's beaches are few and small, carved into the rocky coast by wind and water and devoid of sand. The beach establishments, however, are like seaside salons, with excellent seafood and fish restaurants where you can relax all day long. This village at the highest point on the island is much quieter and more peaceful than the bustle of the center of Capri town. It's a pleasure to wander the lanes lined by artisan workshops, the tiny squares with their majolica benches, and the alleys through houses with traditional barrel-shaped roofs. 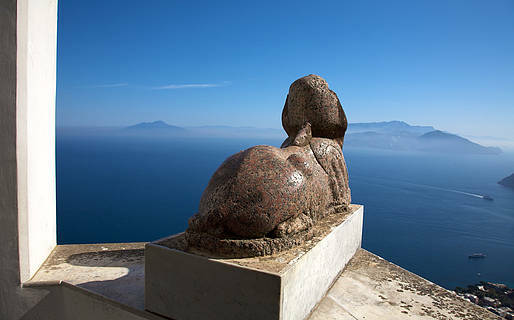 The Swedish physician and writer Axel Munthe built his villa on the most scenic point of the entire island, and dreamed of placing a sphinx statue facing the sweeping view over the sea. He searched for his dream statue during his long trips across Europe, and finally found the perfect one. It still stands guard over the dreams of visitors to the villa and the island of Capri. Get a great meal without breaking the bank on Capri!